Rut Schereiner was born in Argentina. She obtained a piano diploma in her native country and thus started courses in higher education. She arrived in France in 1981 and obtained an orchestra conducting diploma and a music analysis at “l’Ecole Normale Supérieure of Paris”. She then graduated from la Sorbonne with master’s degree in the music and musicology of the 20th century. She also holds a certification in music education and music management (Director) from the Ministry of Culture. She is also the artistic director of “l’Ensemble Diagonal”: a flexible group devoted to contemporary works. Rut Schreiner is regularly invited to give performances in her native country in Teatro Colón (Buenos Aires), where she has recently created two operas. What’s more, she gives conducting seminars and is in charge of Master Classes in Argentine, France, Spain and Switzerland. Her career in Argentine includes engagements with the Bahia Blanca, UNcuyo and San Juan symphonic orchestras. 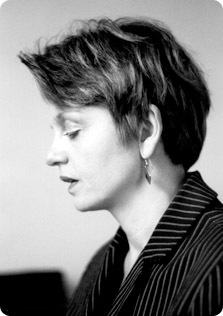 Rut Schreiner is renowned for having conducted a significant number of premières with groups such as: Movimiento, l’itinéraire, Regards, Interface, Ensembles du Conservatoire National Supérieur de Musique de Paris, les solistes from Paris Orchestra, Vortex, Hic and Nunc, (Geneva), Inercia (Barcelona) and Troppi (Buenos Aires). In the last season she was at the head of the Arctic Philharmonic Orchestra in Norway to perform two premières as well as at the Archipel Festival in Geneva and in the months to come the Reims Opera for the opera “Zazie” of the Italian composer Matteo Franceschini. In the months to come, Rut Schereiner will be, among other activities, invited at the Teatro Cervantes, at the Teatro Colon and in the New Opera Festival in Buenos Aires, and she will conduct the Britten’s War Requiem and a recording of contemporary Spanish new music for the label Signature with the Ensemble Diagonal.